The task seemed simple: get a towbar fitted to a Peugeot 307. But no aftermarket towbar specialist seemed to stock towbars for this vehicle, and one guy went even further to suggest that he no longer did Peugeots – it was just too much trouble. A phone call to a Peugeot dealer revealed all. First up, from the dealer the cost of the towbar itself was reasonable - $330 (all prices in Australian dollars). But then the dealer labour was quoted at $500 and the wiring harness at $450! Nearly $1300 for a towbar?! It turns out that the Peugeot uses a tricky wiring system, where connecting a trailer plug normally (that is, with the trailer lights just paralleled with the car lights) will cause internal electronics modules in the car to be killed. That’s why the special Peugeot wiring harness is needed - and why aftermarket towbar fitters steer clear of doing these cars. The same problems are also likely to occur in cars using electronic ‘body computer’ control of their lights (eg by an on-board CAN bus), when electronic flasher circuits are used, and when modules are in place that watch the current draw of the lighting circuits – for indicating when a bulb has failed, for example. But a fix is dead easy and need cost only $50 or so – a lot cheaper than $450! The circuit is very simple – it just uses relays so that the original car lighting circuits need to carry only a tiny bit more current than they do standard. So how much more current then? 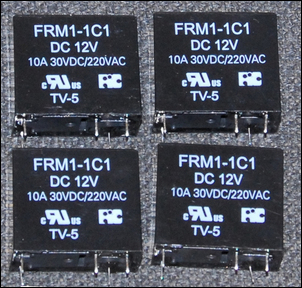 The selected relays use 268 ohm coils. 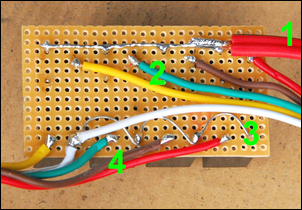 On a running car voltage of 13.8V, that means each relay will draw 51 milliamps from the circuit – or 0.7 of a watt. So by using a relay to drive the trailer tail lights, a circuit that draws 10W (5W each tail light) will have an increase in required power of only 7 per cent – compared with a 100 per cent increase that occurs if you just parallel the trailer tail lights with the car tail lights. To drive the trailer lights in this way you’ll need four relays – one for the brake light, one for the tail lights, and one each for the left-hand and right-hand indicators. You’ll also need to organise a new power feed – we used one taken from the cigarette lighter. So what does the circuit look like? Here it is for one trailer circuit – the complete system requires four of these. 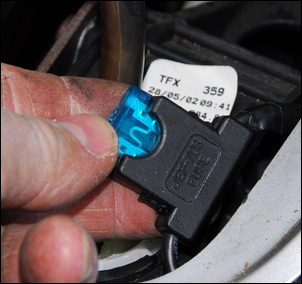 When the car light is turned on, the relay coil is fed power. 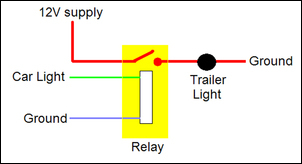 That closes the relay contact, in turn sending power to the trailer light. Simple, huh? 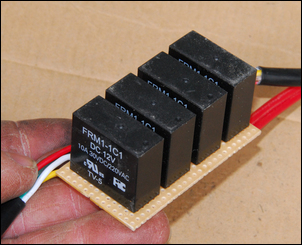 Don’t use heavy duty automotive type relays in this application – these relays often have much higher coil current draws and may overload the circuit or trigger fault codes. The relays were 10 amp units – that is, their switching contacts will take 10 amps, which at running car voltages is over 130 watts... plenty for any trailer lights. The relays were sourced from Jaycar Electronics – cat no SY4050 at just under $8 each. Also bought from Jaycar was some pre-punched board and a box – in the end, I didn’t bother using the box. From an auto parts store I bought the trailer socket and a length of trailer flex – it’s colour-coded in this way: yellow, black, white, green, blue, red and brown. Buying cable with these colours makes it easier to wire the system up. ...and then wired to the cables. Here the top cable (1) is the new power feed that connects to one side of the four ‘switches’ formed by the relay contacts. The other side of those switches (2) connect to the trailer lights – yellow (left indicator), green (right indicator), brown (tail light) and red (brake light). On the coil side of the relays the ‘loopy’ wire (3) connects all of one side of the coils to ground, while the other sides of the coils (4) connects to the car lights, using the same colour coding as above. Note that you should tap into the car lights close to the bulbs, so that you are certain that the wiring is designed to handle bulb currents, not just ECU switching signals. The relay board was heavily wrapped in tape and then cable-tied in a suitable recess behind a rear trim panel. If you get confused with the wiring (and it’s easy to get confused), just wire in each relay as an individual item. ...where a new 15 amp fuse (10 amps would have been better) was also located. 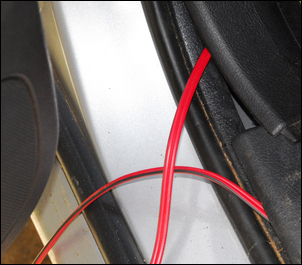 The power feed simply connects to the power side of the cigarette lighter socket wiring. Finally, the trailer socket was wired into place – easy, because we’d used standard trailer colour coding of the wires right the way through.